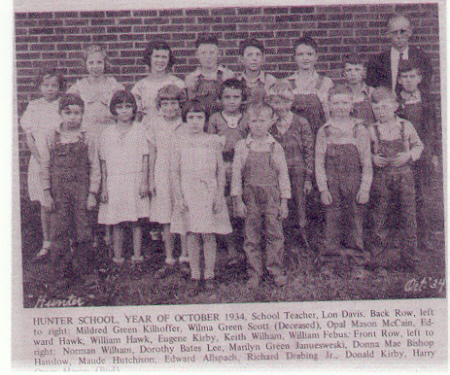 HUNTER SCHOOL YEAR OF OCTOBER 1934, School Teacher Lon Davis. Back Row, left to right, Mildred Green [Kilhoffer], Wilma Green [Scott], Opal Mason [McCain], Edward Hawk, William Hawk, Eugene Kirby, Keith Wilham, William Febus. Front Row, left to right, Norman Wilham, Dorothy Bates [Lee], Marilyn Green Januesweski], Donna Mae Bishop [Hanslow], Edward Allspach, Richard Drabing, Jr., Donald Kirby, Harry "Bud" Mason. Note that every boy has on overalls. This picture was submitted by Nancy Mason Howerton, daughter of Harry "Bud" Mason.